You leave them, we love them! Please complete the form below to submit a request. We will review our availability then reply to you as soon as possible. Please ensure that your contact information is correct so we can reply and confirm your request. Once we confirm your reservation, you’ll need to fill out the Creekside Cats Boarding Agreement if this is your first time, or the Creekside Cats Repeat Boarding Agreement if you have boarded your cats with us before. Which Vet Clinic Do You Use? ---Abbotsford Vet. Hosp.Aldergrove Animal Hosp.Allwest Animal Hosp.Alpha Animal Hosp.Bakerview Pet Hosp.Burton Vet. ServicesClayburn Pet Hosp.Clearbrook Animal Hosp.Coastal Rivers Pet Hosp.Country Grove Vet. ClinicEllwood Park Animal Hosp.Fraser Valley Animal Hosp.Gladwin Vet. ClinicGlenn Mtn. Animal Hosp.Hill N Dale Animal Hosp.Mission Vet. Hosp.South Fraser Animal Hosp.Townline Vet. Hosp. 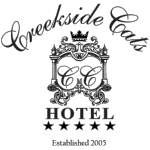 Creekside Cats will confirm your reservation and require a deposit prior to guaranteeing the reservation.